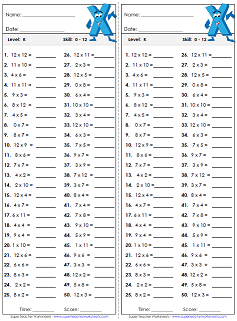 We have multiplication sheets for timed tests or extra practice, as well as flashcards and games. Most resources on this page cover basic multiplication facts 0-10. If you're teaching all the way up to 12, you might want to jump to the Basic Multiplication 0-12 page. For 2-digit and 3-digit multiplication, head on over to the Multi-Digit Multiplication page. In this game, students move from desk to desk, around the classroom, answering basic multiplication questions. Includes 30 game cards, student answer sheet, and teacher instructions. Printable multiplication board game with a space theme. 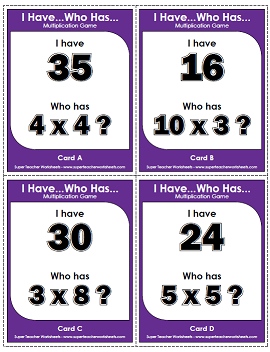 This fun memory card game will help students learn their multiplication facts up to 9 x 9. Roll a pair of dice. Multiply the numbers together to find the product. Each player rolls a pair of dice. They multiply the numbers together to find the product. The player with the largest product wins the round. This is a 2 or 3 player game. Students take turns rolling a die. The number rolled corresponds with a column of math facts on the game board. Students must recite the answers to all facts in the column as quickly as possible. Find the missing factors. Match the problems with the same answers to make stars. 30 different multiplication bingo boards and calling cards. Solve the basic multiplication facts on each puzzle piece and match them to the puzzle pieces with their products. Hunt for 20 complete multiplication facts with this printable number search. Circle each fact you find, and write the complete number sentences on the lines provided. These printable multiplication worksheets have a row of multiplication problems all with factors up to 10. Students can write their answers in the space provided. Write a multiplication fact for each array shown. Use the L-shaped tool to view an array for any multiplication fact up to 10. Teach kids to solve multiplication facts by making arrays with neat rows and columns of symbols. Students draw their own arrays to solve these multiplication facts. Kids will love making these creative city skylines using graph paper! This activity helps them practice basic multiplication skills using arrays. Solve these basic multiplication facts. Then cut out and glue the correct answer to the boxes. Write a multiplication and addition problem for each picture shown. Multiply the number inside the wheel times the number in the middle to find the outside product. A nifty finger trick for multiplying any number by nine. Use the picture clues to help you solve these basic multiplication word problems. Cut out the tiles at the bottom of the page. Glue the tiles into the boxes to make correct multiplication facts. Determine whether each product is correct or incorrect. Count the dots on each side of the dominoes and multiply the numbers together. Unscramble each set of digits to create basic multiplication facts. Fill in the empty squares with factors that will complete the puzzle. Multiply to find out how many ears are on six rabbits, how many legs are on seven spiders, etc. Create number bonds that represent basic multiplication problems. Solve the multiplication facts, then color the boxes according to the key. Students will find a surprise picture. Students write their own rhymes to help learn basic facts. These word problems require knowledge of 0 - 9 basic facts. These linear measurement word problems require only an understanding of basic multiplication facts. Determine the missing factor for each multiplication fact. Use skip counting to learn and practice basic multiplication facts. Includes facts up to 5 x 12. More practice with multiplication facts, using skip counting. Includes basic facts facts up to 10 x 12. This PDF has 30 multiplication task cards with missing factors. Includes 0-10 multiplication facts. What's a twip? To find out the answer to the funny riddle, answer 33 basic multiplication facts. Then match the products to the letters in the puzzle. First decode the symbols to reveal the mystery numbers. Then multiply them together and write the product. A fun crossword puzzle where kids fill in their basic facts. Use repeated addition to solve these basic facts. Includes illustrations of fruit as models. Count the boxes and rows to solve the repeated addition problems. This is a blank multiplication chart the students can fill in. This document contains a completed multiplication table that you can print out. THis is an incomplete multiplication. Some numbers are filled in. Students can complete the chart by adding numbers to the empty boxes. Print 4 miniature multiplication tables on a single page. Write the answers to the multiplication facts (0-6) and color according to the key. Solve the multiplication facts and color to reveal a picture of a rooster. 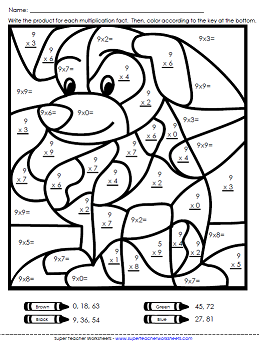 The math facts on this worksheet have factors up to 9. Solve the multiplication facts and color to reveal a picture of a bright orange clownfish. Solve the multiplication facts and color according to the key to reveal a mystery sea monster picture. This mystery pictures has factors between 0 and 10. The finished picture is a red and orange bird in a nest. Write the product obtained by multiplying each pair of numbers. Then color the spaces according to the directions at the bottom. The finished picture is a ladybug on a flower. Use fact family triangles to teach your students about the relationship between multiplication and division. These multiplication and division problems are shown as a family inside of a graphical house. These fact families are presented as factor-factor-product groups. These fact families are presented on circles. Students fill in the missing number for each set. Test students' multiplication skills with this timed quiz with 0s, 1s, and 2s. Facts up to 2x10. Recommended time: 5 minutes. Here's another timed multiplication test with 0s, 1s, 2s, and 3s. Time students to see if they can finish this quiz in less than 5 minutes. Facts include 0s, 1s, 2s, 3s, and 4s. Try this quick multiplication timed quiz.. Facts include 0s, 1s, 2s, 3s, 4s, and 5s. This is a five-minute, fifty question multiplication test.. Facts include 0s, 1s, 2s, 3s, 4s, 5s, and 6s. Build speed and accuracy with this multiplication quiz. Facts include 0s, 1s, 2s, 3s, 4s, 5s, and 6s. Here's another quiz for assessing students' knowledge of basic facts. Facts include 0s, 1s, 2s, 3s, 4s, 5s, 6s, 7s, and, of course, 8s. When students have learned their facts up to 9x9, try this timed test. Facts include 0s, 1s, 2s, 3s, 4s, 5s, 6s, 7s, 8s, and 9s. Yet another timed test for building accuracy and speed. Facts include 0s, 1s, 2s, 3s, 4s, 5s, 6s, 7s, 8s, 9s, and 10s. Basic Multiplication Facts 0-3, up to 3x10. Basic Multiplication Facts 0 through 4, up to 4x10. Basic Multiplication Facts 0 through 5, up to 5x10. Basic Multiplication Facts 0 through 6, up to 6x10. Basic Multiplication Facts 0 through 7, up to 7x10. Basic Multiplication Facts 0 - 8, up to 8x10. Basic Multiplication Facts 0 - 9, up to 9x10. Basic Multiplication Facts 0 - 10, up to 10x10. According to the distributive property of multiplication, "a multiplication array can be divided into two smaller arrays. When you add the products of the arrays, they equal the product of the larger array." Here's a slightly more advance worksheet on the distributive property of multiplication. This is another intermediate-level worksheet that focuses on the distributive property of multiplication. The commutative property says, "the product of a multiplication problem does not change when you change the order of the numbers." Learn about the associative property of multiplication, which states that: "the product of a set of numbers is the same, no matter how they are grouped"
We have thousands of multiplication worksheets. This page will link you to facts up to 12s and fact families. We also have sets of worksheets for multiplying by 3s only, 4s only, 5s only, etc. Practice more advanced, multi-digit problems. Print basic multiplication and division fact families and number bonds. Practicing skip counting skills can help students master their multiplication facts. Practice using the the distributive, associative, commutative, and identity properties of multiplication.